Personally, I'd enjoy it while I could. But a recent jackpot winner at Slotland has decided to enjoy his recent win after he's dead. He says he will live forever thanks to his $5,000,000 win. Samuel J. won the record-breaking jackpot playing Slotland’s Too Good to be True slot game. He says he’ll use his incredible win to pay for his body to be frozen for a hundred or so years. 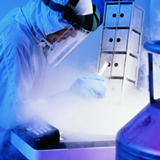 Present state-of-the-art cryonics technology can successfully preserve the human body with remarkable integrity. Jackson says his body will be cryogenically preserved at the Everafter Cryogenics Lab in Palo Alto, California where has left instructions to be woken up when his first great-great-great-great-grandchild is born. Everything about this story is a joke – except the fact that Slotland’s progressive jackpot, which is tied to most of the one-of-a-kind slot games at the unique casino site, really is won so often that it’s always hit long before it reaches five million. Last month, Johnathon E. won $159,357 playing the Ice Queen slot game on his cell phone. The jackpot is currently just under $90,000. Slotland has 31 slots and video poker games that aren’t offered anywhere but Slotland. They can all be played on any mobile device but 14 are available in the mobile casino that is especially enhanced versions for iPhone and Android phones.